Researchers from North Carolina State University have developed a new technique to control self-folding three-dimensional (3-D) structures. Specifically, the researchers use templates to constrain deformation in certain selected areas on a two-dimensional structure, which in turn dictates the resulting 3-D structure of the material. The new technique does not rely on cutting or printing on the material, as most other self-folding origami techniques do. It is also different from continuous shape morphing, which is typically controlled by engineering the in-plane strain at various parts of the material. Instead, the researchers applied paperboard sheets to a polymer substrate, forming specific patterns. By varying the pattern made by the paperboard templates, the researchers are able to create a variety of shapes, from simple cones to complex, tiered structures. The self-folding operations can be executed at temperatures as low as 120 degrees Celsius. “This is a proof of concept paper, and next steps include incorporating functional electronic elements into the material, giving it potential value for manufacturing applications,” says Jianxun Cui, first author of the paper and a postdoctoral researcher at Carnegie Mellon University who worked on this project while a Ph.D. student at NC State. The paper, “Origami/Kirigami Guided Morphing of Composite Sheets,” is published in the journal Advanced Functional Materials. The paper was co-authored by Felipe Poblete, a Ph.D. student at NC State. The work was done with support from the National Science Foundation under the Emerging Frontiers in Research and Innovation program, grant number EFRI-1240438. Abstract: Several strategies have been recently exploited to transform 2D sheets into desired 3D structures. For example, soft materials can be morphed into 3D continuously curved structures by inducing non-homogeneous strain. On the other hand, rigid materials can be folded, often by origami/kirigami-inspired approaches (i.e. flat sheets are folded along pre-designed crease patterns). Here, for the first time, combining the two strategies we fabricate composite sheets by embedding rigid origami/kirigami skeleton with creases into heat shrinkable polymer sheet to create novel 3D structures. Upon heating, shrinkage of the polymer sheets is constrained by the origami/kirigami patterns, giving rise to laterally non-uniform strain. As a result, Gaussian curvature of the composite sheets is changed, and flat sheets are transformed into 3D curved structures. A series of 3D structures are folded using this approach, including cones and truncated pyramids with different base shapes. Flat origami loops are folded into step structures. 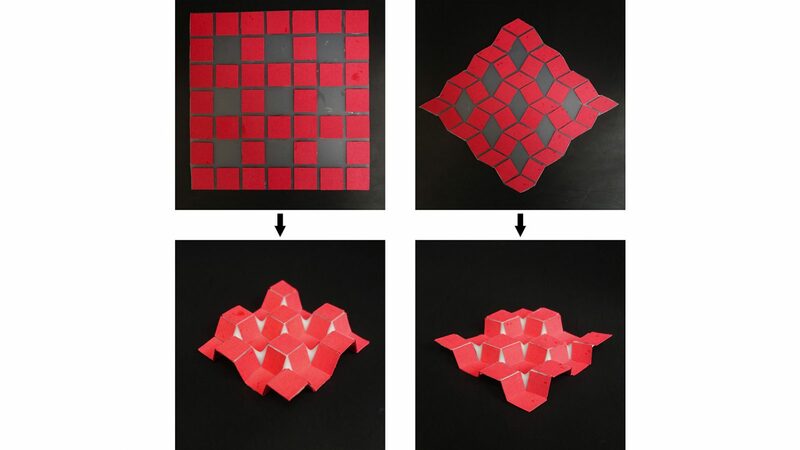 Tessellation of origami loops is transformed into 3D checkerboard pattern.